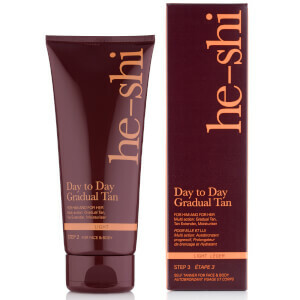 Discover a moisturising self-tan with the He-Shi Face and Body Tanning Gel; a hydrating formula that works to provide a streak-free, golden glow for up to 10 days. Ideal for dry skin and suitable for both the body and face, the self-tan offers an instant, enviable glow from head to toe. The lightweight gel formula glides onto skin and is easily absorbed, leaving you smooth and ultra-hydrated. Utilising moisture-lock technology, the hydrating tan creates long lasting results, as well as alleviating the visible signs of ageing to leave skin visibly rejuvenated. The self-tan can be reapplied in several layers, allowing you to build your desired colour; ranging from a golden glow to a deeper tan. 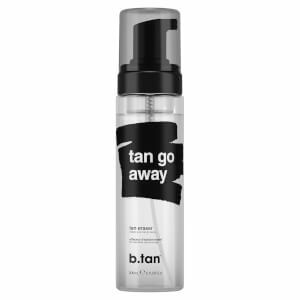 Due to its innovative formula, you can apply the tan in confidence, without worrying about streaks or unsightly patches. Expect an even colour that gives you long lasting glow. Aplique uniformemente no rosto e no corpo com movimentos de passagens. Vista-se depois de 2 minutos, quando o gel for completamente absorvido. Evite o contacto com a água e transpiração durante 6-8 horas enquanto o gel bronzeador se desenvolve. Dica de He-Shi: pode ser usado no rosto com uma base que durará toda a semana. Não é necessário entupir os poros com outros produtos. Aqua ((Water)Eau), Dihydroxyacetone, Propylene Glycol, Isopentyldiol, Hydroxyethyl Acrylate/Sodium Acryloyldimethyl Taurate Copolymer, Ethoxydiglycol, Saccharide Isomerate, Polyisobutene, Dmdm Hydantoin, Aloe Barbadensis Leaf Juice, Peg-7 Trimethylolpropane Coconut Ether, Peg-40 Hydrogenated Castor Oil, Panthenol, Tocopheryl Acetate, Sorbitan Isostearate, Retinyl Palmitate, Arachis Hypogaea Oil, Parfum (Fragrance), Citric Acid, Sodium Citrate, Bha, Bht, Potassium Sorbate, Hexyl Cinnamal, Ci 19140 (Yellow 5), Ci 16035 (Red 40), Ci 42090 (Blue 1).